He is a graduate of the Kunitachi College of Music and the University of Alabama, and his primary teachers were Dr.Demondrae Thurman, Professor Toru Miura, Dr.Mitsuru Saito, and Kozo Takeuchi. Won First Prize in the 24th Japan Wind and Percussion Solo competition in 2007, the 2010 Leonard Falcone Euphonium Solo Competition, the 2010 University of Alabama Concerto Aria Competition, both the solo and chamber music competitions at 2011 Southeast Regional Tuba Euphonium Conference, and Third Prize in the Lieksa Brass Week 2nd International Euphonium Competition in August 2011. 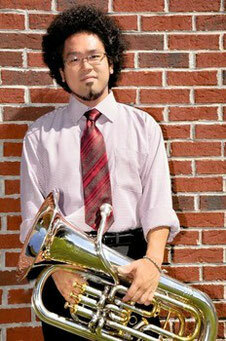 Currently he is working as a freelance euphonium player in Tokyo, Japan. Released the CD as a member of "Boreas Quartet" in 2014. He is also a member of "Euphonium Tuba Collective", the Euphonium player in Spiel kammerensemble. A part-time teacher at Kunitachi College of Music since 2014.